Modified, close, medium, wide and spider man. What do these random words mean? On the page they have very little meaning and my instinct is to gloss over them in search of something with more coherency and significance. But…when these words are combined with my new 100 Push Ups Challenge (in real time!) they’ll be an integral part of your being as you huff and puff your way through this mammoth bodyweight fitness workout! It is an intense passion of mine to bring you workouts, programs and challenges that are easily accessible and can be performed immediately…anywhere…and anytime. Why push ups? I’ve been adding 100-300 push ups to my workouts for the past month with devastating results. What’s improved? My endurance, core stability and strength, focus, control, discipline, imagination (yes, that’s another area where I want to excel) and breath control. My standard MO in the gym – Nick’s Pro Fitness – is to drop down for a set of 10-25 push ups and then move quickly onto some other exercises like pull ups, goblet squats, tearing apart the battle rope and then returning to the dusty ground for another set of push ups. Filming this video was a challenge because there were no distractions and other movements I could switch to in the name of cross training. Nope, this was a straight up push up extravaganza with the wind blowing me and my camera to the point of launching us into the sky. I had the image of a Lord of the Rings push up workout. Or, perhaps a Les Miserable workout. A LOTR’s mention might sound weird but when I’m exercising my mind is SUPERCHARGED! 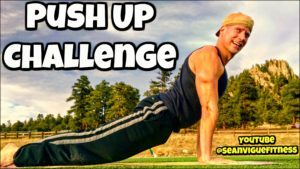 Sean’s 100 Push Ups Challenge – tell us how many push ups you did in the About section of the video! Throw in some extra credit by adding my 140 (!) Push Ups Challenge. Tear it up! GIFT IDEA!! Message me SeanVigueFitness@gmail.com if you’re giving my bestselling book, Power Yoga for Athletes as a gift and I might send you a personalized autograph label. When you email me send me the name of the person you’re buying the book for and the address I need to send it to. Christmas, birthdays, job promotions, graduations etc it’s the PERFECT gift for people of all ages and fitness levels. Click the photo below and order that copy (or copies) for the loved ones in your life!